Our bearings and seals are from USA & German manufacturers. The seals are double lipped with high quality retainer springs. (no steel or cheap seals). 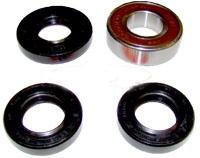 The bearings are high quality, and have less rolling friction than other brands. This Bearing carrier (Bulkhead housing) rebuild kit is for the Hydrospace S4 only.